Merry Christmas everyone! We were lucky enough to have two Christmases. The first one was at mums. 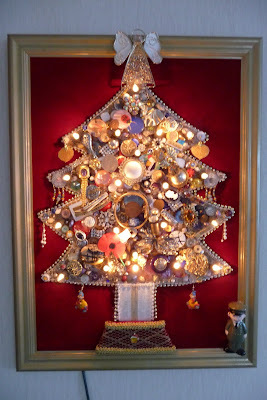 A few years ago Mum made this Christmas tree with old trinkets and things that sparkle. There are all sorts of things special to Mum and our family like the tree trunk that is made from an old calendar from the year my grandmother was born. Marsh loved the wrapping paper. Ahh what better than a post Christmas dinner nap! Oh Hi.....it's a great tree. You can look at it for hours. Mum raided our jewellery boxes and old trinkets to gather the stuff to put on it. There old hair rollers, and earrings and broches, coins & buttons....you name it....it's there. And then she blew up my hot glue gun putting it all on there! Looks great aye?